Does your company exhibit at trade shows? Just about most type of flight case will be a useful means of transportation and handling for any exhibition or trade show. Be it a general-purpose road trunk for ancillaries or merchandise, a 19″ rack system for AV control equipment, LED screen case or a bespoke design of trunk to house a specific piece of the exhibition booth itself! However, 5 Star recently introduced the Exhibition Pod System, which is proving to be extremely popular with companies wanting a bespoke, affordable, modular and quick to assemble exhibition display system. Quick set-up time saves money! 5 Star Group has the infrastructure at its Cambridgeshire factory to produce much more than just cases. With three large-format CNC machining centres, spraying systems and associated woodwork and panel fabrication machinery, and years of experience in design and manufacture. In addition to this, recent investment in digital printing and laminating facilities, 5 Star’s Exhibition Pod System is becoming a popular choice when it comes to affordable trade show booths. 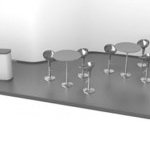 Although each Pod can of course be made to individual customer’s dimensions, the Exhibition Pod System utilises a few standard modular size options. The standard pod can be easily accommodated within most Shell Scheme layouts. Each pod is of the same modular size, constructed from plywood and finished in a hard-wearing synthetic textured paint, available in a variety of standard colours. Although white is a popular choice, as it easily compliments all other colour schemes that the booth may have. Pods can be left predominantly ‘open’ so that small to medium sized products can be either fixed on to the panel or on shelves. In addition to this, printed graphics panels can be incorporated to display your company services and larger products. However, it’s the built in LED screen and Full HD media player that really is a key feature of 5 Star’s Exhibition Pod System. There’s no need to spend a small fortune hiring an exhibition booth when you can have your own designed and built, exactly to your requirements! These future-proof pod system offer quick set-up time, are visually attractive and can be reused many times, maximizing the investment. Low energy LED strip lights can be incorporated into the pods, for display illumination. These can be either single colour white or multi-coloured changing types for added effect. All mains wiring is built in and fed from a single IEC in/out connector on the rear. Thus a ‘daisy-chained’ system can easily be set up in next to no time! All the main pods are stack-able onto each other, ensuring built-in product displays, graphics and the LED screen is well protected in transit. Packing crates can also be manufactured to accommodate a number of stacked pods.